Save your photos! Well, some of them. Sometimes I read how others delete all the shots they aren’t immediately happy with, not just those that were out of focus etc. As I have written before I do go through and quickly delete photos that are obviously not up to par (focus accidents, test shots etc) – but then I tend to sit back and digest them for a while. Immediately after I shoot the impressions I have of the results may not be very objective. I wait for a while to process most images so I can more clearly see what is going on, and to distance myself from my initial expectations. Even after some distance and thought I do not always get things “right” in my choices, and sometimes images fall through the cracks. The image here is one such example. This is a late evening shot I made in Mount Rainier National Park in October, 2010. Ricksecker Point is a good vantage point for Rainier itself, but unless you get some really special light things will look just like all the other “iconic” shots from the same spot. I had gone there hoping to get some good sunset shots near the Tatoosh Range but this just wasn’t going to happen with that day’s conditions so I started looking for alternative compositions. 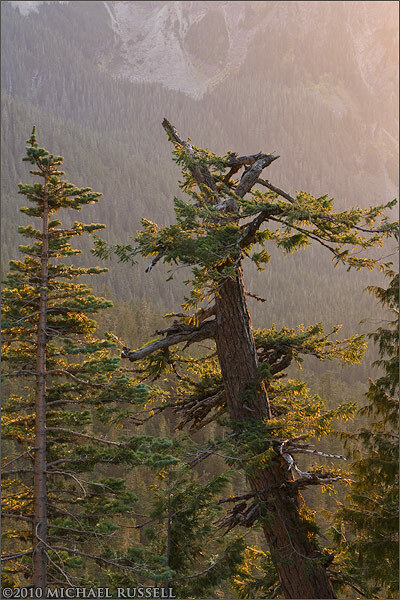 I noticed the glow of the late evening light on these fir and cedar trees and made a few photographs of what I saw. When I first looked at these at home though, they did not really seem to stand out. A few weeks ago I was going through some of my folders of photographs from 2010. I like to review things occasionally and look over shots I have passed by in favour of images that, at the time at least, appear stronger. I noticed this shot and was somewhat surprised I had never really noticed it before. It had not been a throwaway but was not selected for bigger things at the time either. I am curious what other photographers do with the shots they initially think are “borderline”? Do you purge everything but the strongest images right away or do you sit on a lot of shots so you can evaluate them later? I used to. Immediately. Photos when the intended target was not in focus but the background was. Then I began to realize that sometimes these project a different mood. Now I save them to look at later. I haven’t posted any that I can recall. But I appreciate that they are worth keeping.